Limited space on rigs and floating production, storage and offloading (FPSO) units requires compact design of any machinery. Claire Cole reports. Considering the number of pumps required in various applications makes designs with increased efficiency and pumping power in a reduced footprint and weight appealing options to the oil and gas industry. Diaphragm pumps are widely used in the oil and gas industry across much of the supply chain for pumping fluids and injecting chemicals. They are appealing because they provide precise injection of chemicals and can handle aggressive and harmful fluids safely. Hermetically sealed diaphragm pumps provide leak-free operation combined with the advantages and accuracy of reciprocating plunger pump technology. The design principle of plunger pumps means they cannot be operated leak-free unless equipped with sophisticated lubrication, flushing and sealed drainage systems. 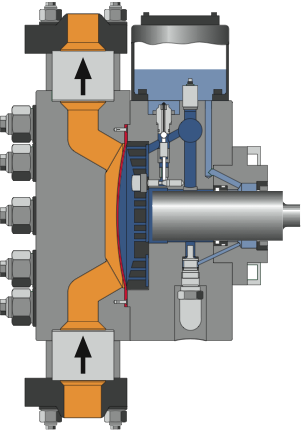 Diaphragm pumps overcome all these draw-backs as the diaphragm separates pumped liquids from the atmosphere as well as from its hydraulic drive mechanism. The diaphragm in a hydraulically operated diaphragm pump moves with hydraulic oil which is pushed backwards and forwards using a plunger. As the diaphragm moves backwards it increases the volume inside the pumping chamber, creating a suction effect and opening the inlet valve. Equally, as the diaphragm moves forwards it reduces the volume in the pump which opens the outlet valve and pushes the liquid out. As such the diaphragm fulfils two major functions: Firstly, transmitting the reciprocating motion of the drive and secondly sealing the liquid from the outside. Apart from the diaphragm, the only moving parts of the pump in contact with the fluid are specially designed valves on the inlet and outlet. Diaphragms are often manufactured from the omni-resistant material Polytetrafluoroethylene (PTFE). Metal diaphragms can also be used to handle requirements for higher pressure, temperature and highly permeable fluids like liquid carbon dioxide. With a reduced number of wear parts in contact with the pumped fluid, a diaphragm pump offers reduced maintenance compared with plunger equivalents. Furthermore, operating security can be increased if sandwich diaphragms with condition monitoring are utilised. A single acting oscillating positive displacement pump has a suction stroke followed by a discharge stroke in sequence. Using the double acting design with the displacer suction and discharge stroke operating simultaneously will effectively double the pumping capacity. Originally developed for plunger pumps, this theory, when applied to a diaphragm pump, gives the advantage of leak-free, low maintenance handling of aggressive and harmful fluids with the increased pumping efficiency of a double acting pump. This results in a double acting diaphragm pump which can replace an equivalent duplex pump while offering a significantly reduced footprint and overall weight. 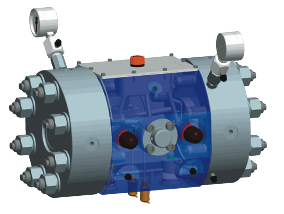 When SPX considered the challenges faced by the oil and gas industry in maximising efficiency within limited space and weight constraints, developing a double acting hydraulic diaphragm pump seemed a beneficial option to all – harnessing the advantages of using a diaphragm and the capacity of the double acting pump principle. 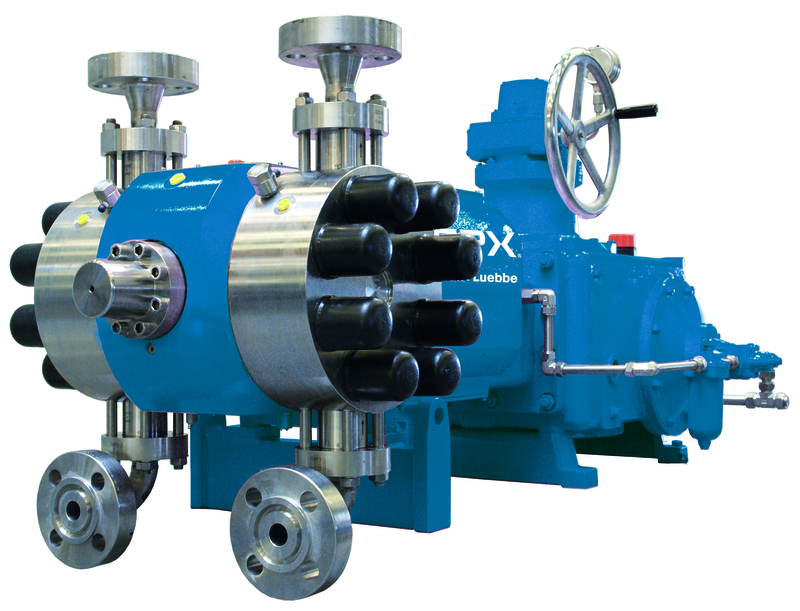 The success of this SPX product is based on the innovative combination of two well-proven pump head designs which have been utilised by SPX for many decades. 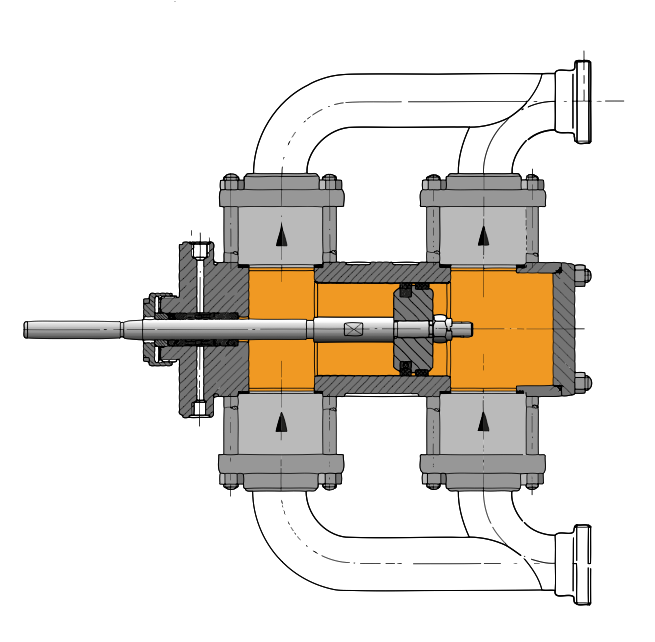 The resulting pump provides the capacity of an equivalent duplex pump but in a much smaller and lighter format. Typically, the single, double-acting pump is up to 20 per cent smaller in size and weight than an equivalent duplex, single acting pump configuration. Using diaphragm technology, the pump is ideal for use with numerous liquids including hydrocarbons, LPG, butane and naphtha. Manual and automatic control options and the ability to combine various gear size add flexibility to the pump design. Furthermore, SPX is known for its flexibility in developing customer specific solutions and is happy to discuss explicit application requirements and how they can be met with this new and innovative pump design. Overall, using a double acting diaphragm pump head has real benefit, particularly for the oil and gas industry. It provides a solution to handling fluids with highly efficient machinery while reducing cost, space and maintenance requirements. While SPX uses innovative technology, the pump is based on proven, reliable designs to give complete peace of mind for its safe use within the industry. High-pressure pumps - what price reliability?